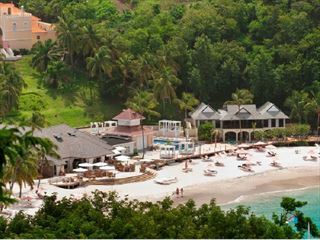 Set amongst 45 acres of spectacular tropical flora, in its own secluded bay, Smugglers Cove is an ideal destination for families and couples seeking a relaxing vacation. 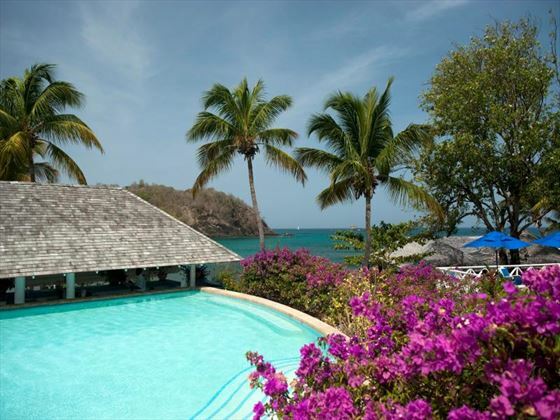 An idyllic location, the views here are truly breath-taking – we love the tranquil atmosphere here. The choice of activities is extensive, so you needn’t worry about running out of things to do. 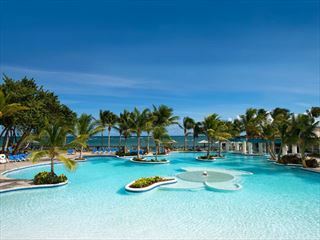 There are tennis courts, seven glistening pools, a fully-equipped fitness center and a long stretch of coastline that lends itself well to watersports in the sunshine. 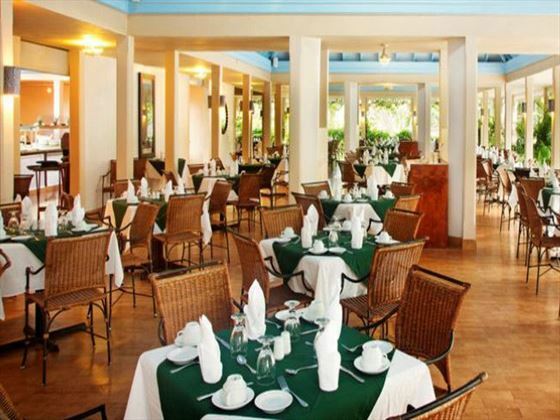 Even the fussiest of eaters will be able to enjoy fantastic meals here, with a choice of four restaurants to cater to your culinary cravings – from classic Creole to international fare, this resort provides a great place to relax and enjoy great food with your loved ones. There’s nightly entertainment if you want to carry on the fun, as well as a great kid’s program to keep young ones entertained during your stay. Top tip: The Namaste Spa is the perfect place to unwind and let go of your stresses and worries. 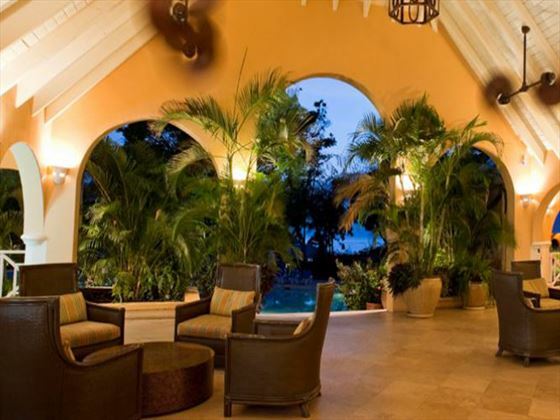 There are 357 rooms and suites located in low rise, single-story buildings set in tropical gardens. 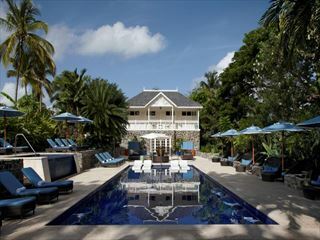 Island Room (previously Standard Rooms) – Nestled throughout the property, overlooking the tropical gardens. Accommodates max 3 adults or 2 adults and 2 children 0-16yrs sharing double sofa bed. 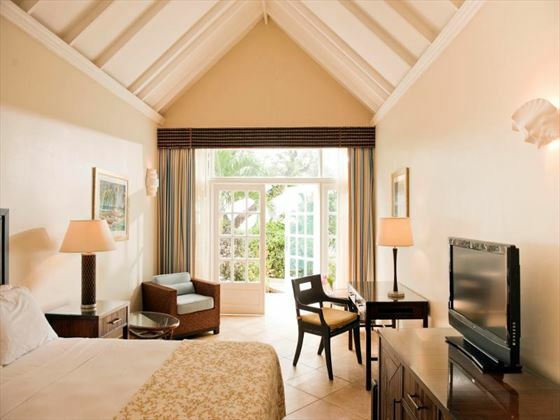 Deluxe Room (previously Deluxe Garden View) – These rooms have vaulted ceilings and spectacular garden views. Accommodates max 3 adults or 2 adults and 2 children 0-16yrs sharing double sofa bed. 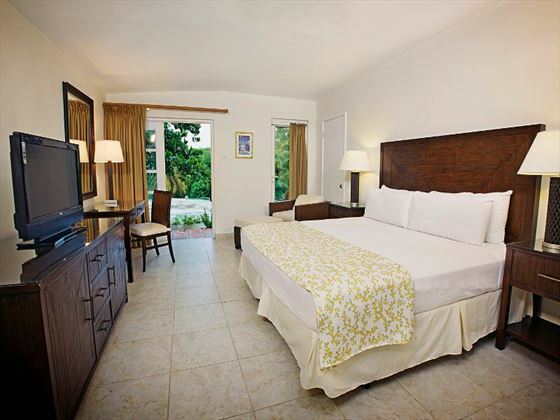 Premium Room (previously Superior Deluxe Garden View) - Located on a hillside near The Racquet Club with tropical garden views, these rooms are peaceful and situated away from the main activity areas of the resort. Accommodates max 3 adults or 2 adults and 2 children 0-16yrs sharing double sofa bed. 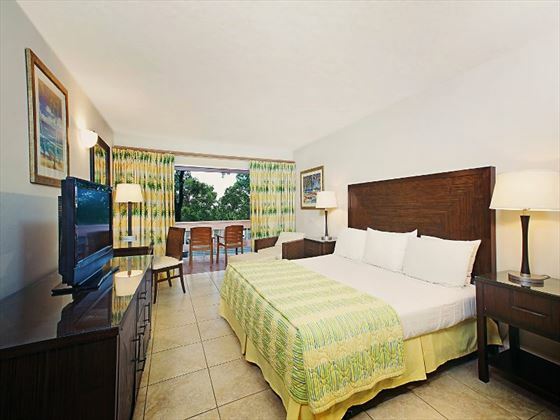 Premium Beachfront (previously Superior Deluxe Beachfront) – Set near the beach or atop a hillside, these are spacious rooms with Japanese soaking tubs, perfect for watching a Caribbean sunset over the ocean. Accommodates max 2 adults with one king size bed - no twin beds possible. Premium One Bedroom Suite (previously One Bedroom Garden View Suite) – Offer a spacious bedroom with an adjoining living room, some separated with louvered French doors. The bedroom flows into a large vanity area. Bathrooms with walk-in showers can be requested. Accommodates max 4 adults or 2 adults and 2 children 0-16yrs sharing 1 kings size double and a double sofa bed, or 2 adults and 3 children with the 3rd child on a single rollaway bed. Maco’s Kids Club – Varied activity program with playgrounds, supervised children’s pools and fully equipped activity centers to keep younger guests entertained and well looked after. The nursery welcomes newborn infants under 2 years of age; the Mini Club is suitable for ages 2 - 4 years; the Kids Club is suitable for 5 - 12 years, and the teen center is for teenagers. 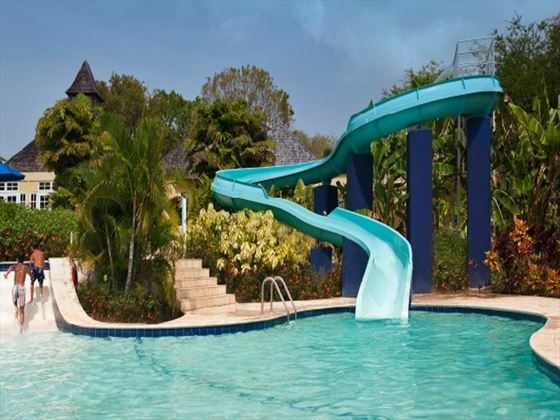 Seven freshwater swimming pools, including two adult-only and one with a 100ft waterslide. The Cove – International all day restaurant offering buffet-style dining, with themed buffet dinners. British-style high tea is served every afternoon. 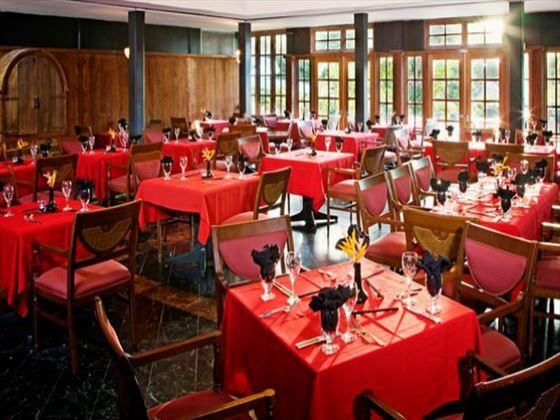 Waterside Creole Grill – Offers a selection of classic Creole cuisine, overlooking the Caribbean Sea; open for breakfast and dinner. Cafe Asia – Authentic Asian cuisine, including Thai, Japanese and Chinese flavors. This restaurant is open for dinner only and exclusively for guests over 16yrs old. La Trattoria – A casual and relaxed Italian restaurant serving pizzas, handmade pastas and salads; open for lunch and dinner. 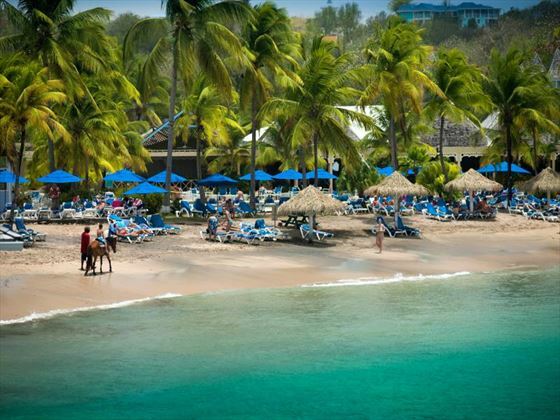 In addition there is a weekly traditional Caribbean Beach Barbeque. When dining, closed in shoes must be worn, bathing suits must be covered and men must not wear tank tops or sleeveless shirts. For dinner, after 6.30pm men have to wear pants and women have to wear dresses, pants or culottes (no shorts or short outfits) at the 3 a la carte restaurants, and closed in shoes must also be worn. 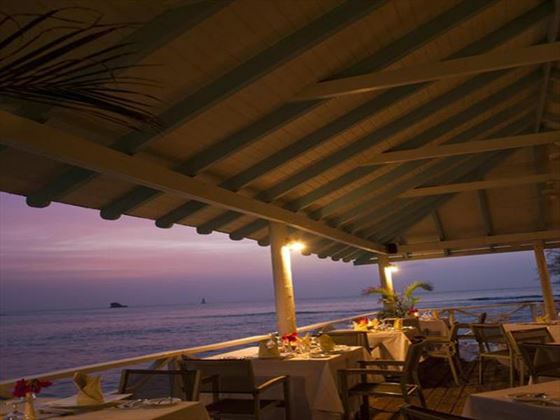 The Cove restaurant offers a more relaxed and informal dining experience and dress shorts are permitted for dinner. 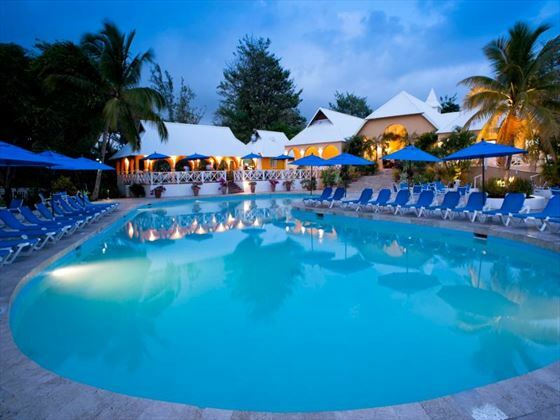 Please note that as of 1st August 2014 the resort is managed by Blue Diamond Hotels & Resorts.